What if you didn't have to worry about what's for dinner? One of the hardest parts of eating well all week long is the amount of thought, planning (and can you say, stress?) that goes into it. Piling that on top of the rest of life, can be enough to make even the most committed among us say forget the lettuce, we're ordering pizza. There's enough in life to stress over. Wouldn't it be nice if what to eat didn't have to be one of them? 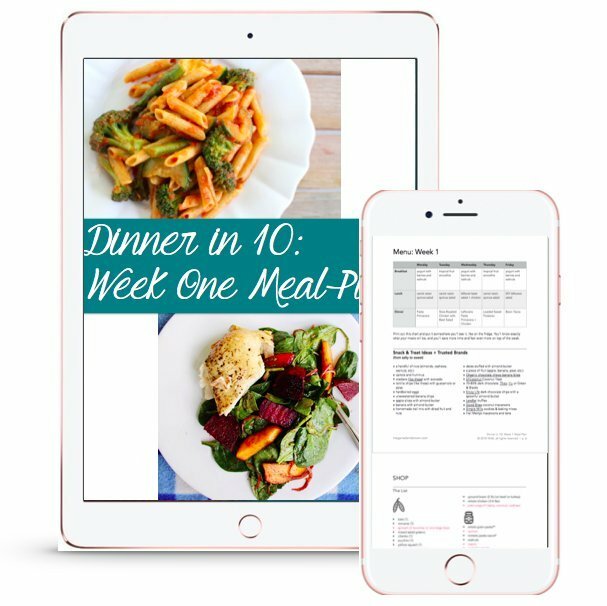 Dinner in 10 is a one-month meal plan and so much more. It shows you the ropes, and "teaches you to fish" so to speak so by month's end you're more confident in the kitchen, and able to whip up something to eat in a matter of minutes. Dinner in 10's almost ready, and I can't wait to share it with you. Sign up below and I'll let you know as soon as you can start not thinking about "what's for dinner?"